Such was the case recently with a round can of guava paste. I picked it up at a local supermarket with an excellent Latin American food section, intending to use a bit of it in a baking experiment, but wasn’t quite clear on what to do with the rest. I mean, there’s a crapload of it stuffed in there. 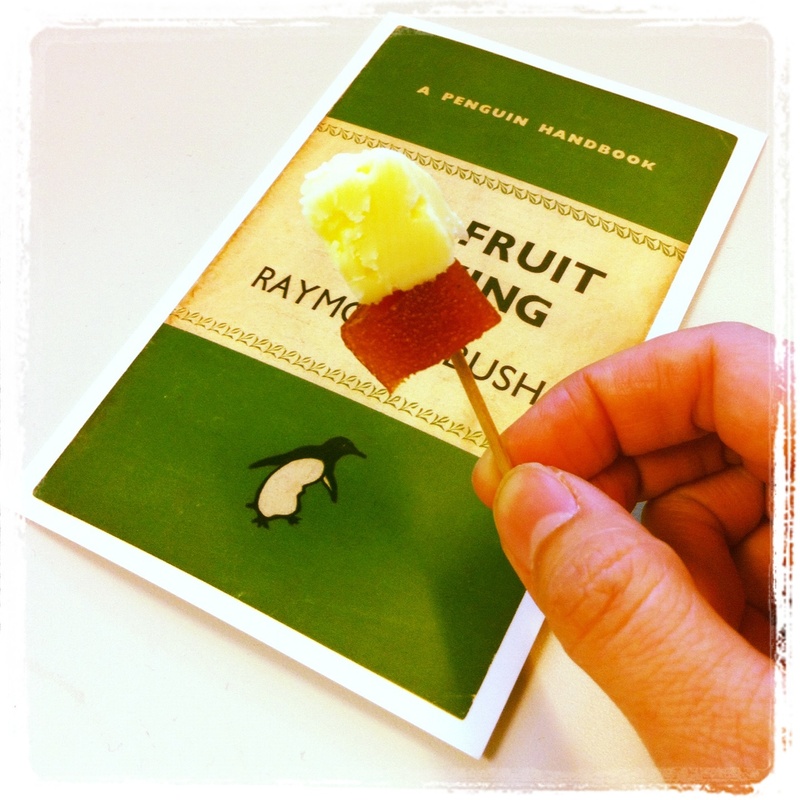 It sort of looks like that gelatinous cranberry jelly that pops out of a can, only darker, thicker and tastier. Ta-da! Guava macarons, straight up. 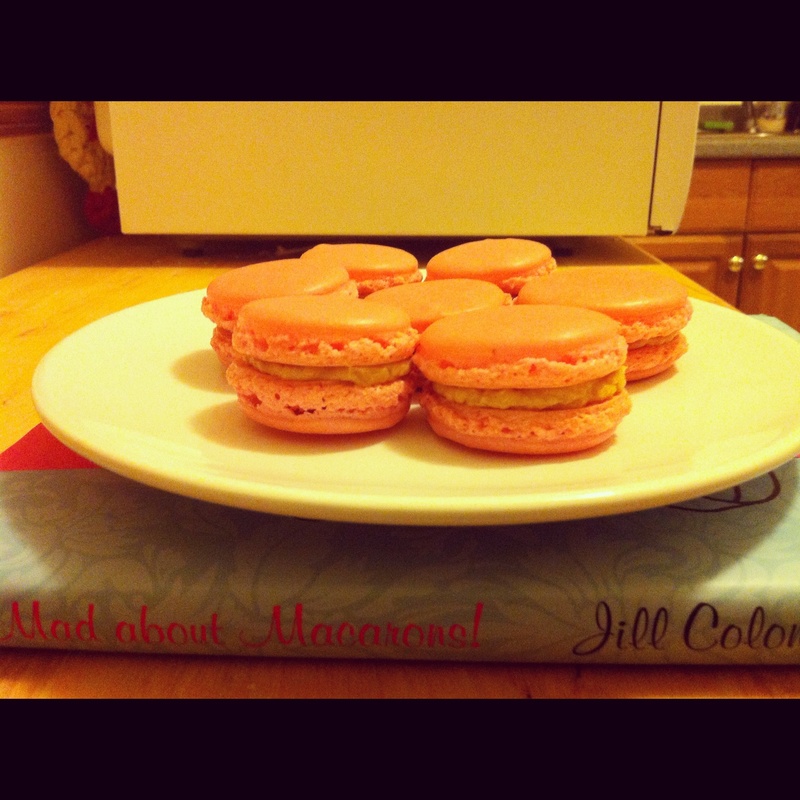 I’ll post a recipe shortly for these guava macarons. 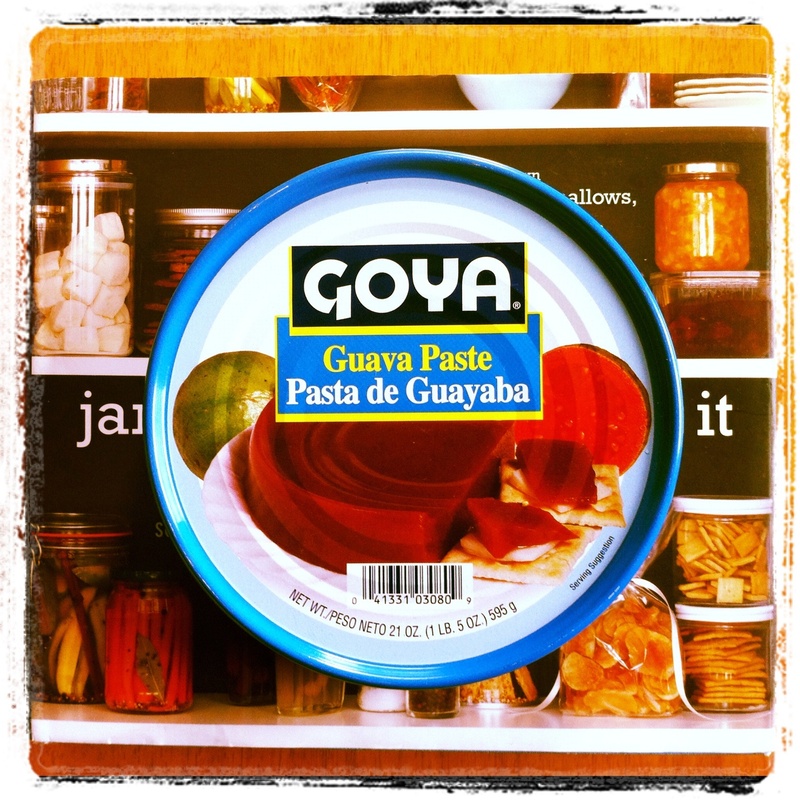 In the meantime, here’s a fresh and simple way to munch your way through a whole can of guayaba paste: Stick cubes of paste and a white cheese (the stronger-tasting, the better) with a toothpick, add some bread, and have yourself a little feast. Muy bueno! It’s official: The Swedish chef has better cooking equipment than I do. Although from the looks of things, he doesn’t seem to know how to use them very well. I’ve always been more of a sweets person, and have earned a reputation as the baker in my family long ago. My little proto-hipster sister, who was a Food Network aficionado long before it went mainstream, was always the cook. Naturally, when I moved away from home, I had a lot of catching up to do in terms of cooking skills, and now, I’d like to think I can hold my own in the kitchen. 8) a dusty ebelskiver pan, a gift from my proto-hipster sister. Got that even before making Danish ebelskiver was cool. 9) and a little chef’s knife from Macy’s that makes a clicking sound whenever I cut things. I think the blade is coming loose. Armed with my motley cookware crew, I managed to turn out countless dinners and even whole Thanksgiving and Christmas feasts, and I am actually proud of that. I figured, Hey, villagers in remote areas of the world don’t use All Clad cookware and they are still able to make amazing food, so why can’t I? Still, I decided to try upgrading my equipment, mainly because I was getting tired of having to scrape off stuck-on food at the bottom (my foray into chili pretty much ruined the pot I found in the hallway–charred black bits that stubbornly clung for days, despite marathon soaking and scraping sessions). Which led me to the big question that every home cook has: What to buy, what to buy? Usually, for a shopaholic like myself, that’s one of those questions that only invites trouble for my already anemic wallet. So I looked to the pros for guidance on what kind of pots and pans are essential to any kitchen. Michael Ruhlman recommends starting out with small and large sauté pans, small and large sauce pans and a large pot to boil things in. I assume he means a stock pot. Mark Bittman of the New York Times confirms my theory that even crappy pots and pans can yield beautiful results, and recommends going to a restaurant supply store to get cheap equipment, including three saucepans, a nonstick pan, a heavy duty steel pan and one lid. But he also thinks that rice cookers and woks are non-essentials, which is pretty much blasphemy in any Asian kitchen. Hm. The list of experts offering up their opinions goes on and on, so I thought I’d look to my friends, the ones who really know how to cook. Naturally, I thought of my friend Kate, who used to be a line cook at such fine restaurants as Terra in Napa Valley and A16 in San Francisco. (She is also the co-author of the acclaimed A16 Food + Wine cookbook, incidentally; I once made the Monday Meatballs from that book and they were excellent.) She also has a great blog, Modern Meal Maker, and in one of her posts, she recommends a 4-quart pot, a smaller pot, a Dutch oven and a 10-inch sauté pan. Well, I’ll definitely have to make some decisions now and do a little more research and maybe some saving. In the meantime, I’ll keep on cooking, using my humble little pots and pans, doing the best I can to make the best food possible for the people I love. In the end, I think, that’s what really matters, right? Well, actually, more than 99 bottles. Last week, I thought I’d surprise Dr. J with some hard-to-find India Pale Ales, so Yelp directed me to a glorious place called Westover Market in Arlington, Virginia, whose claim to fame is its Great Wall of Beer. There are apparently more than 1000 varieties of bottled and kegged beers, both domestic and international, ready to be chugged. It took me a while to browse through everything, but I saw some pretty impressive craft beers that are hard to come across in regular markets: Dogfish Head, Allagash, Rogue Alehouse, Founders, Green Flash, Bell’s, Oskar Blues, Hitachino Nest, Victory Brewing Company, Lagunitas, Ommegang, even The Bruery, a microbrewer in my old stomping grounds of Orange County, CA. (Who would have thought the OC could yield good beers?) 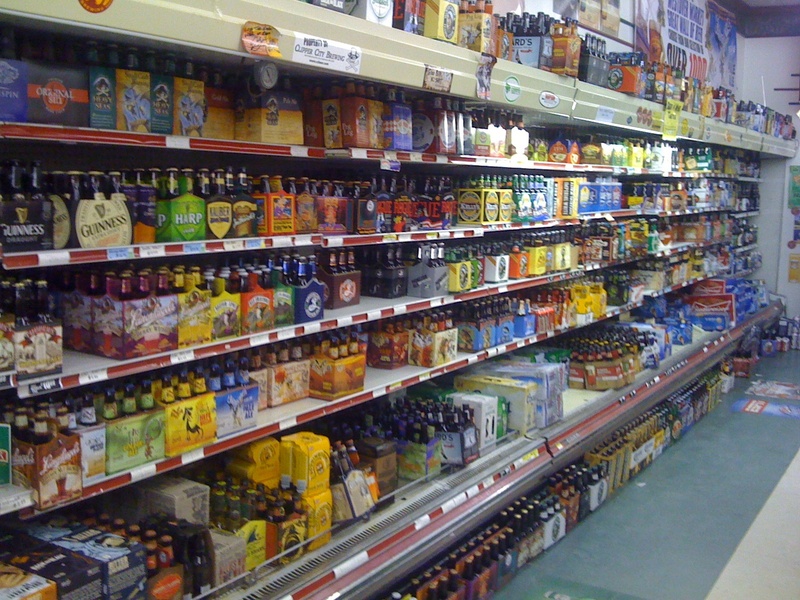 You’ll even find a good selection of hard-to-pronounce Belgian, German and Japanese beers here. Obviously, these guys are pretty serious about their brews. I mean, they even have a T-shirt with “The Great Wall of Beer” emblazoned on the front, so you know they mean business. And people are literally drinking it up. I saw that they were doing a beer tasting, and people of all stripes were standing around, red Dixie cups in hand, as if it were a high-brow frat party or something. It was refreshing to find a place that has a decent beer selection. When Dr. J and I were living in Davis Square during our Boston-area days, we’d always end up at Downtown Wine and Spirits, which was just a stone’s throw away from our apartment and had a smaller but more finely edited selection of interesting labels you’d never find at the average liquor store. 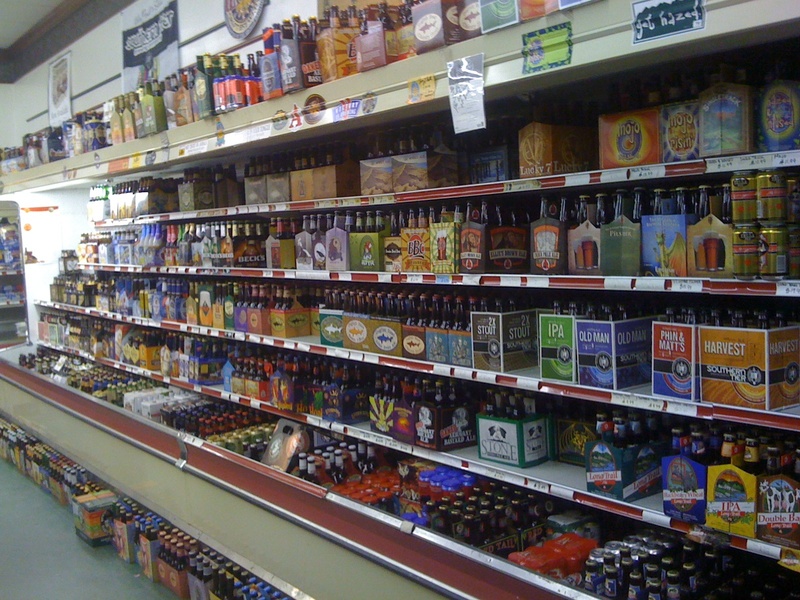 Even though it’s not as convenient to get to, and even if it doesn’t have some brands that we might like better, I have a feeling Westover Market will be our new go-to place for weekend beer runs. Once I paid up and got ready to leave, I realized I forgot to take pictures, so I dashed back to the wall and started snapping away. One guy, who was there with two friends, smiled and said, “You must be as excited as we are, huh?” They’d all driven down from Maryland–on a weeknight, no less!–just to check out the Great Wall. Beer. It brings people together. How could I have not known about Modcloth? Not only are the clothes cute, but they also focus on independent designers, vintage pieces and innovative wares at fairly decent prices. Also, kudos to the site’s copywriters for coming up with clever descriptions and funny style names, which rely on puns and pop-culture references to get the point across, such as “This Tee is Grrrreat” tiger head-print shirt, the “Zig-a-zig Ah” printed dress, and the “Night at the Crops-bury” sequined cropped tank top. (Admittedly, they can get carried away sometimes, but the site is so fun it’s easy to overlook those moments.) Modcloth is like Anthropologie’s snarky, potentially dorkier younger sister–in fact, the site styles its clothes in true Anthropologie.com fashion. It was just on the outskirts of Chinatown, down the street from the Orange line Chinatown stop (obviously). I missed it a few times because the storefront didn’t look much like a grocery store. But entering the store, a familiar sensation hit me like a ton of bricks–and I’m not talking about that characteristic fishy smell that so often assaults your nostrils even before you set foot inside the door. It’s that feeling of pure glee, that “kid in a candy store” kind of excitement. Before moving to Boston, I had prepared myself for a year of living “caucasianally,” meaning going without easy access to my favorite Asian ingredients at cheap prices and having to shop at Shaw’s or any of the various Italian-American independent stores. Not that I have a problem with that–I’m as much into freshly made portobello mushroom ravioli, spaghetti and meatballs, burgers and fries and meatloaf as the next chowhound. But no fermented tofu? No green curry paste? No morning glory? A little part of me died inside at the idea. I might mention that the store wasn’t exactly the cleanest place in the world, what with rotting vegetables sitting on a “clearance” shelf, brownish, barely salvageable bean spouts and a shady-looking box of raw chicken drumsticks sitting unrefrigerated on the floor in all its salmonella-y glory. Also, I shudder to think how long some of their packaged goods have been on the shelf. But as a shopper who’s hard up for the simple joys in life, like boxes of Pocky, canned bamboo and water chestnuts, chrysanthemum tea, seasoned seaweed snacks, dried sour plums, steamed red bean cakes, Korean barbecue marinades, mochi, rice crackers and sriracha sauce, to name a few, I ain’t complaining too much. It’s not the greatest photo in the world, but you don’t need a Nikon to figure out the gist of the place. This huge, two-story warehouse, located near MIT, is best known for its crazy selection of Halloween and costume gear, as well as nice vintage clothes. Its “clothes by the pound” setup on the ground floor, however, is a draw for most bargain shoppers who come here to find a steal–and a point of notoriety for germaphobic, hyperallergic shoppers who’d rather blind themselves with Purell than rifle through a pile of dirty clothes on the floor. The concept sounds cool enough for a vintage/secondhand clothing buyer such as myself. You get a big plastic bag and you fill it up with stylish garments (admittedly of dubious origin), then you weigh the bag on a scale and pay $1 a pound. Not bad, right? I thought so myself, so I tried it one night during the Halloween costume rush. At first, as I gingerly picked through the clothes, fearing that I’d come across some poop-stained pants (as one Yelper described in her experience at the Garment District), find some lice-ridden, moth-eaten sweater, or at the very least catch pinkeye from a jacket that had been passing through the Goodwill/Salvation Army/homeless shelter circuit since 1954. I tried not to think about what might be lurking underneath the mountain of clothes, or how long they’d been there, and instead focused on the task at hand: finding something, anything, that is remotely cute to make the experience–and risking catching a disease–all worth it. After about fifteen minutes, I finally found an adorable cream secretary blouse in what looked to be my size. Score! Spurred on by the excitement of the find, I renewed my search for more clothes, digging a little more confidently and actually stepping into the middle of the mess to see if I’d missed anything. My story has a rather mundane ending: I basically lost my nerve and took my slim pickings to the cash register. The grand total? 30 cents. While I couldn’t shake the feeling I had creepy crawlies on my clothes and hands when I walked out of the Garment District, I think I’ll be back again for round 2. Only maybe next time I’ll bring some latex gloves and maybe a face mask and goggles. P.S. I’d show you a picture of what I bought, but I haven’t gotten around to irradiating the thing. From tampon cozies crocheted out of thrift-store wool to a brooch made with a dead turtle claw (really, I’m not kidding) to a baby gown made out of a recycled Lil Kim t-shirt to fetus-shaped catnip toys, nothing completely off-the-cuff is safe from blogger Helen Killer’s hateration. Sure, it’s mean-spirited and juvenile, but I’ve gotta say–it’s pretty clever as far as its writing style goes. Insult comedy is great. You just need a thick skin to be on the receiving end, which maybe a lot of Etsy sellers and Regretsy haters don’t have. And you know how they say even bad publicity is good publicity? A lot of these subjects of ridicule are flying off the virtual shelf–including said Lil Kim baby gown. Goes to show that there really is something for everyone on Etsy. Even if that something is a crocheted meerkat Christmas nativity set.